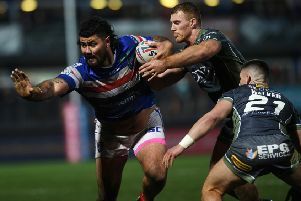 Centre Joe Arundel has become the latest Wakefield Trinity player to sign a new contract. The former Castleford Tigers, Hull and Bradford Bulls player has agreed a deal which will keep him at the club until the end of 2019. Arundel, 25, has scored 13 tries in 65 appearances since joining Wakefield in 2015. He said: “I am very pleased, it is good to get my future sorted for the next two years and I look forward to progress [ing] and build [ing] on what has been a successful time so far. Trinity coach Chris Chester said: “I am delighted that Joe has committed his future for another two years.